This winter trip begins in the cities of Moscow and St. Petersburg, before heading north to explore the lesser-known Republic of Karelia. Here discover the UNESCO-Listed wooden churches on Kizhi Island by hovercraft and explore the Kivach Nature Reserve. Arrive in Moscow and check in to hotel. Depending on the time of your arrival there may be time to explore some of Russia's capital independently. Moscow is one of the largest cities in the world, yet the historic centre is a relatively compact and easily navigable area with fascinating architecture around every corner. Our hotel is situated a few minutes\ walk from the Partizanskaya metro station making it easy to travel in to the historic centre, reaching Red Square in approximately 15 minutes. Next door to our hotel are a flea market and the Vernissage where folk crafts and antiques are on sale. If you're booking your own flights then please ensure that you let us know whether you're arriving into Domodedovo International or Sheremetyevo International Airport so we can arrange your transfer accordingly. The day begins with a guided tour of Moscow using the metro as our method of transport around the city. This also allows the chance to see some of the impressive underground metro stations, adorned with decorative artwork on the walls and huge chandeliers. Our tour will take us through the particularly grand Komsomolskaya and Novoslobodskaya stations, en route to sites including the Kremlin and Saint Basil's Cathedral. The tour of Moscow will end in Red Square, where locals go about their daily business wrapped up against the Russian winter, and at this time of year it may be possible to witness the iconic St. Basil's Cathedral in the snow. For lunch you may wish to visit the canteen in the famous GUM department store. The store was the main shopping mall during Soviet times, and is worth a visit to see the large architecturally stunning hallways. The Soviet-style canteen has a large array of tasty foods to warm you up including authentic dishes; warm up on the classic Borscht soup that can be found across Russia and Eastern Europe, or try the Pelmeni dumplings. After lunch we will travel to some of the more outlying areas of Moscow in a private bus, including Lenin Hills where we should get a great panoramic view of the city. We will also pass by the UNESCO-Listed Novodevichy Convent and Cemetary, considered one of Moscow's most attractive monasteries with its red walls and golden dome. There is some free time later this afternoon and early evening to have some dinner, before taking the overnight train to St. Petersburg. We will be travelling on the famous Red Arrow Train, which during Soviet times carried the Communist Party elite between Moscow and Leningrad (now St. Petersburg) and has been operating since 1931. The train has been kept in its original style, so it's a unique experience and like taking a step back in time to an era when train travel was at its prime. The accommodation is in four-berth compartments with bedding provided. The overnight train we plan to use for this holiday departs at 23.20 and arrives to Petrozavodsk at 06.50 the following day. After arriving in St. Petersburg and fuelling up on breakfast, a local guide will join the group to begin exploring the city by bus. St. Petersburg, formerly known as Leningrad, was founded by Peter the Great as his 'Window on the West'. Built on the Neva River, the city is considered Russia's cultural capital and one of the most beautiful cities in Europe, with its intricate architecture, and picturesque bridges crossing the river. St. Petersburg has a wealth of history for us to uncover, and we begin this morning as we visit many of the sites of historical importance. The tour will take in Saint Isaac's Cathedral, Smolny Cathedral and the Church of the Saviour of the Spilled Blood.?? After the tour we will check-in to our hotel, and the afternoon has been left free to relax or explore the city independently. Today begins with a visit to the Hermitage Museum, one of the largest and most prestigious art galleries in the world, showcasing the works of artists like Leonardo da Vinci, Titian, Raphael, Velázquez, Rubens and Rembrandt, as well as contemporary pieces by Matisse and Picasso. Founded by Catherine the Great in the late 18th Century, the Hermitage collection is so large that if you were to see all the works on display and stop for one minute at each, it would take approximately 9 years. The afternoon and early evening have been left free to explore the city and have dinner. This evening we leave St. Petersburg behind as we board an overnight train heading north to Petrozavodsk, where we enter the Republic of Karelia. The accommodation is in four-berth compartments with bedding provided. The Karelian region is renowned for its charming wooden villages, churches, and its countryside full of lakes, rivers and forests. Situated on the shores of the ice-covered Lake Onega, the city of Petrozavodsk will be our base for the next three days. After disembarking the train and having breakfast at a local restaurant, we'll visit the tiny rural village of Kinerma. Here we can see original Karelian wooden architecture and it was voted one of Russia's most attractive villages. A very small number of people still live here permanently, continuing to live and farm the land using traditional methods. In the winter months the snow-capped wooden roofs create a true winter wonderland atmosphere. Here we see a living example of traditional Russian settlement, and also visit the Chapel of Our Lady of Smolensk at the heart of the village. We'll have tea and homemade berry pies in a wooden Karelian house. We drive on to Karjala Husky Park where we'll have a masterclass on how to cook the local Karelian speciality of lohikeitto soup made with salmon, potatoes and leeks. We'll then get to taste our soup along with meat and potato dishes that will be served in a tchum; the traditional tent dwelling used by the reindeer herders from the north western Siberia, and it's covered in reindeer hide to protect from the harsh winters. Arriving back in Petrozavodsk this afternoon we explore the city and become acquainted with the history of the capital of Karelia. Petrozavodsk was founded by Peter the Great in 1703 initially as an iron factory and quarrying centre; the name Petrozavodsk literally meaning 'Peter's factory'. Today the city has fine examples of 18th century Neo-classical architecture, and this tour will visit the main sites including Lenin Square and the surrounding historical buildings, Kirov Square, and take a walk along the lakefront promenade where we can see monuments that have been gifted to the city over time. With strong ties both culturally and linguistically to neighbouring Finland, Petrozavodsk has been described as a Russian city with a dash of European influence. This morning we board a hovercraft travelling to Kizhi Island in the centre of Lake Onega. During the Soviet Union, various pieces of wooden architecture were collected from around the country and brought to Kizhi for preservation purposes. Today this collection exhibits nearly 100 wooden structures showcasing true examples of traditional Russian wooden architecture, symbolised by their octagonal shapes, spires and topped with magnificent domes. During our visit we will see the Kizhi Pogost; a UNESCO-Listed wooden church - one of the tallest wooden buildings in the world. While the structures here are considered some of the most beautiful in the country, this architecture can be seen used in day to day life during our time in the Karelian region. After spending time exploring the island, we visit the local café in the harbour where a traditional herbal tea-tasting will be put on with Karelian pasties, also known as kalitka. After warming up, the hovercraft travels back to Petrozavodsk where we are free for the remainder of the afternoon. This morning we drive to the Nordic Husky Farm. After an introductory briefing, we spend time getting acquainted with the beautiful huskies, learning some facts about their breed and characters. The musher will advise on how to harness the dogs and how to control the sledge. The sledding route follows approximately three kilometres through the snowy forest. At one time two or three sleighs will be out, while the rest of the group walk with the guide and look out for the huskies and sleighs in the distance. After a barbecue lunch at a nearby café we'll continue onwards to Kivach Nature Reserve where the natural beauty of the region becomes apparent, especially in winter. Visit the impressive frozen Kivach waterfall surrounded by snow covered pine forest, and learn more about the local flora and fauna at the museum and dendarium - Botanical Park. Next we drive onto Marcial Waters where the first ever Russian spa was created. In the Soviet times it was the best sanatorium in Karelia and still today it is a very popular place. Whilst at the spa we'll have the chance to taste the waters that are reputed to have healing properties. We'll also visit the ancient Church of Saint Peter, which was designed by Peter the Great. Return to Petrozavodsk this evening you are free to have dinner in one of the many restaurants that serve creamy fish soups, meat stews and hearty mushroom dishes, followed by a glass of Karelian balm; an alcoholic drink infusing 30 types of berries and herbs. After a busy day yesterday, today has been left free to enjoy the city of Petrozavodsk and our last chance to soak up Karelian culture, before meeting back at the hotel in the late afternoon to take the fast train back to St. Petersburg, approximately a 5 hour journey. During the day you may wish to visit the National Museum of the Republic of Karelia, where thousands of historical items tell a story of this region; the history, culture, and nature of the Russian North. The trip ends in St. Petersburg this morning, after breakfast. Opera or ballet €50-150.00. This optional is subject to availability and performances may sell out. If there is a particular concert or venue you wish to visit, or you just want to ensure you're able to get a ticket to a performance, then we recommend booking your tickets online directly with the theatre production company before leaving the UK. As we have limited time in Moscow, you may wish to extend your trip pre-trip if seeing the opera or ballet is a must for you. Kremlin Armoury Museum is €35.00 (€40.00 for groups under 10) with a guide or 700 RUB for entrance only with audio guides available in English. Saint Peter and Paul Fortress entrance is €25.00. Yusupov Palace entrance is €28.00. Alexander Nevsky Lavra (Monastery) entrance is €5.00. Cruiser Aurora Museum 450 RUB. In Russia weather conditions can change rapidly - sunshine, drizzle, rain and snow may all occur in the same day. In winter temperatures can drop to -20 degrees centigrade. You'll need to take very warm clothing for outdoor activities, so pack warm layers of breathable fabrics. A good quality heavy duty wind and waterproof jacket and trousers are essential. We'd also strongly recommend packing thermal underwear, fleece under trousers, a fleece jumper, woolly hat, thick socks, scarf or snood and gloves (and glove liners for when you're taking photos). You may also find ski trousers or salopettes and a ski face/neck mask useful. Bring warm waterproof walking boots that have sufficient grip for icy conditions and are waterproof in case of snow. You may wish to bring a spare pair in case your feet get wet and your boots don't dry out overnight. You may also find a pair of snow boots useful and trainers for using indoors in the hotels. Spare camera batteries can be useful as these do not last long in cold weather. In case of emergency we also recommend that you carry a torch and a first aid kit. Sunglasses, sun hat and sunscreen may be beneficial on clear blue sky days as the sun can be very strong. We also recommend bringing your own water bottle to reduce plastic consumption. You may find taking some over shoe ice grips to be of use and walking poles in case of icy conditions. Although entirely voluntary, tipping is a recognised part of life in this region of the world. Some local staff will look to members of the group for personal recognition of particular services provided. Accordingly you should allow approximately 30 Euros for tips. In order to make things easier for you, the Explore Leader may organise a group's tips kitty and if this is the case, they will account for it throughout the trip. For the overnight train journeys we will use sleeper carriages with four bunk beds with bedding provided (two beds on floor level and two above) per compartment and with a shared toilet and wash basin in each carriage. There are no shower facilities on board. Luggage is stored under the bottom bunk beds and above the cabin door for the top bunks. There is the possibility that you will be sharing with non-Explore mixed gender clients in the same cabin. You can experience authentic rail travel with the local people and it's a great way of getting from place to place during the night, so you maximise on the amount of time you have in each city during the day to explore. Take snacks, drinks, toilet roll, hand sanitiser and an open mind with you for maximum enjoyment. 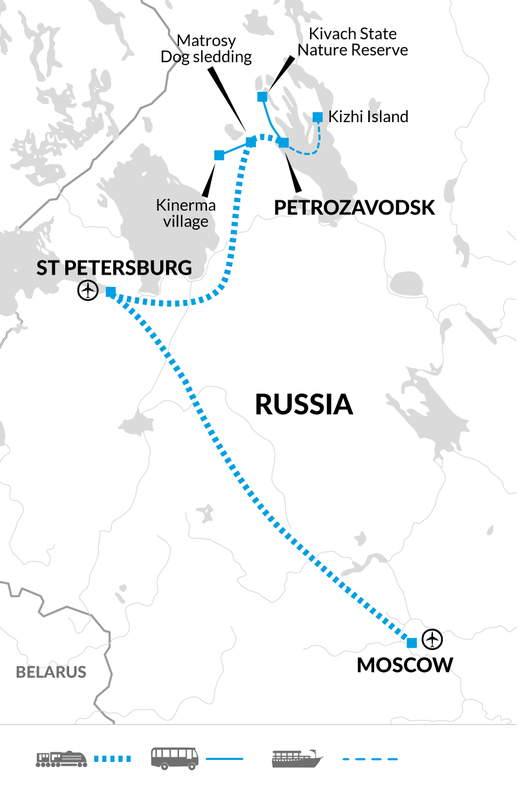 Between Moscow and St. Petersburg we will be using the famous Red Arrow Train, which in Soviet times carried the Communist Party elite between Moscow and Leningrad (St. Petersburg) and has been operating since 1931. The train has been kept in its original style, so it's a unique experience for us and like taking a step back in time to an era when train travel was at its prime. Please note for many attractions and sites you visit during the tour, you will not be allowed to take coats or bags inside. These will have to be checked into the cloakrooms available and so customers are advised to carry a small bag for wallets/purses, mobile phone, personal docs etc in whilst inside the venue. When you think of Russia, many people picture the famous sights of Saint Basil's Cathedral and The Hermitage in Moscow and St. Petersburg. On this winter trip you will not only discover these highlights, but also head north to the Republic of Karelia, known for its beautiful natural scenery and wooden villages peeking through a layer of snow. Discover a lesser visited area of Russia and explore a true winter wonderland. Picture frozen waterfalls and lakes, dog-sledding with huskies through snow covered pine forest, and eating hot Karelian pies to warm you up from the sub-zero temperatures.